With COMPact – our new shifting clutch system – we have taken another step toward the future. The hydraulically actuated, wet-running clutch unit with flange connection, integrated oil supply, and hydraulic control can be installed on a ship as a ready-to-use compact unit. There are numerous application areas for this self-contained clutch unit. 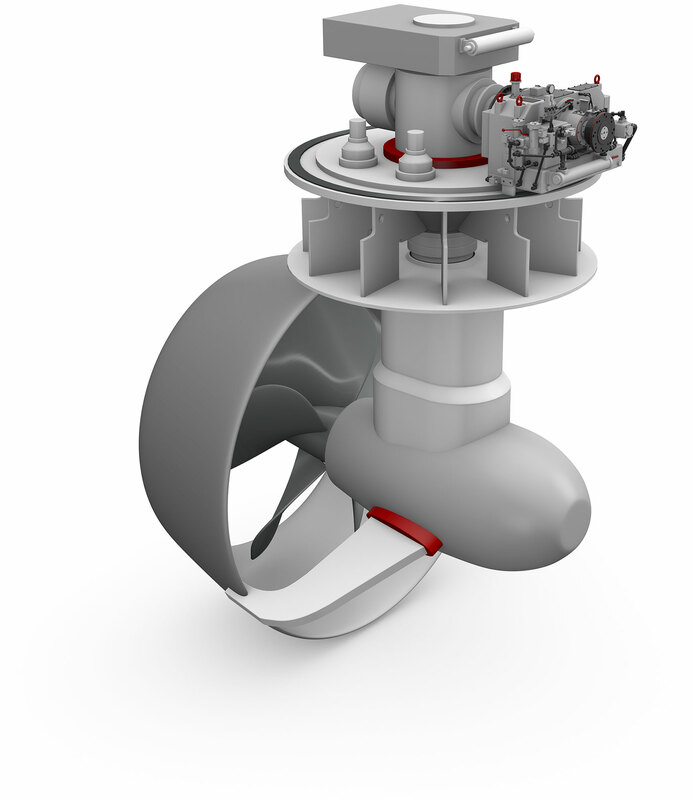 It functions as a connecting unit between the engine and the above-water gearbox – for instance in rudder propellers – and as a shifting clutch between the ship’s main drive and the propeller shaft for working ships, tugboats, supply ships, yachts, passenger ships, and ferries. The COMPact can be used for situations when permanent slipping at idle speed is neccessary. Further the clutch system has a power take off which can be used for a hydraulic pump for example.COMPact impresses with a series of technical innovations and advantages, which make it efficient and economical to use. COMPact is a sophisticated end-to-end system, which, for example, allows complete installation of the rudder propellers in to the ship. The clutch system does not require its own foundation and can be flanged directly to the gearbox. This space-saving feature and installation directly at the take off guarantee our customers time and cost savings for installation and maintenance, while ensuring delivery from a single source. The wet-running of the clutch ensures wear-free operation and problem-free trolling (within defined technical limits). The supply of pressure oil and cooling oil is integrated with a built-in oil tank. As a result, no external controls are required and separate pumps, valves, and heat exchangers are made superfluous. Defined drive interfaces enable simple assembly of the drive shaft through adjusted connection dimensions. In addition, defined connection dimensions in the take off interfaces guarantee optimal connection to the gearbox. COMPact’s design facilitates the simple assembly of an additional auxiliary output, e.g. for a variable pump for rotating the rudder propeller. The operation of COMPact generates little noise. The auxiliary output takes place by way of a chain drive and is surprisingly quiet, according to feedback from our customers. Built-in sensors produce all necessary signals for operation and monitoring. This eliminates the need to install additional sensors and makes overall installation much easier. Practical experience and cumulative expertise from 75 years in marine technology are the foundation for our success. COMPact is a new product development that needed less than a year to advance from conception to the start of production. It is the result of the close collaboration with a customer, Ortlinghaus branch management, and the R&D department. Providing pressure and cooling oil is an integral part of product development. This dispenses with the need for external hydraulic actuators including piping and separate pumps and valves. Another major factor is our high degree of integrated value creation: Manufacturing all of the relevant components of COMPact ourselves significantly expedites the development process.